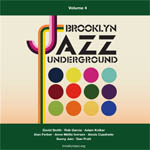 Brooklyn Jazz Underground is an association of independent artists with a shared commitment to creativity and community. Through cooperative efforts, the BJU aims to build a greater awareness of original music emerging from Brooklyn, NY. Former members include: Dan Pratt (tenor saxophone) , Alan Ferber (trombone), Alexis Cuadrado (bass), Sunny Jain (drums), Shane Endsley (trumpet), Jerome Sabbagh (tenor saxophone), Tanya Kalmanovitch (viola), Ted Poor (drums), Benny Lackner (piano). From its inception the BJU, a highly influential group that inspired the formation of other artist collectives around the world, including The Paris Jazz Underground, The Queens Jazz Overground and The LA Jazz Collective, has always placed a premium on original composition. The band's much-anticipated second recording, 7 x 7, offers a collection of seven compelling works conceived by each member of the septet, featuring David Smith (trumpet), Adam Kolker (tenor sax, bass clarinet), Anne Mette Iversen (bass), Rob Garcia (drums), and also featuring the addition of vocalist Tammy Scheffer, who plays a shifting role here as a vocalist and as a third "horn", pianist David Cook & drummer Owen Howard, empowering the ensemble alongside Rob Garcia with a dual drummer thrust. While each piece exemplifies the character of the individual composer, the ensemble devised a cohesive element to lend unity to the entire recording: "The Shorty," a brief composition derived from each of the seven original works. The creative twist was that these variations were to be composed by a fellow BJU artist. "We literally drew names from a hat to pick which composition was to be our 'assignment.' Whether inspired by a melodic phrase, a harmonic structure or simply the vibe of the initial work, each 'Shorty' in turn, found its own character," explained Owen Howard (from the liner notes). 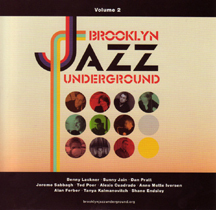 The Brooklyn Jazz Underground, featured in the March 2012 issue of DownBeat Magazine, is an artist run association that is in constant motion and evolvement. They are pleased to announce the release of the first Brooklyn Jazz Underground Ensemble recording, A Portrait of Brooklyn, initiated by a grant from the Brooklyn Arts Council, and featuring David Smith (trumpet), Adam Kolker (tenor sax, alto sax, clarinet, bass clarinet, flute), Dan Pratt (tenor sax, clarinet, flute), Anne Mette Iversen (bass) and Rob Garcia (drums). The CD was released on June 26, 2012. From 2008-2011 released BJU each year a CD Sampler with one track from each member. The CD samplers presented the bandleaders and what they were working on at the time. Some tracks have not been released on any other publicly available CD, and they also is great documentation of the BJU's on-going growth and development. Brooklyn Jazz Underground members anno 2010. Brooklyn Jazz Underground members anno 2008.